Amina Elshafei is blessed with a rich family history – her mother is Korean, and her father is Egyptian. Join her on a unique culinary adventure, exploring the best cuisine from both cultures. 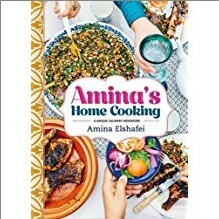 Here you ll find recipes for traditional Middle Eastern dishes such as Lamb, Prune and Fig Tagine and Korean staples such as Kimchi, as well as exciting new recipes, such as Sumac-crusted Trout with Heirloom Tomato Salsa and Harissa Chicken.